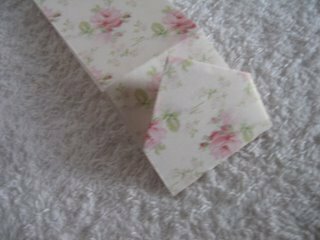 A mini envelope... for hidden messages... for the recipients eyes only! 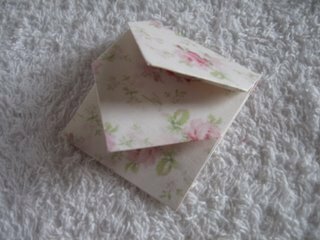 This simple mini envelope is an easy topper to add to your cards, just a couple of folds and... Hey Presto! 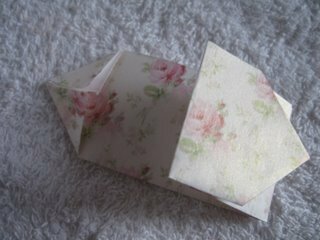 Hide a secret message in this mini envelope and add it to the front of your cards. 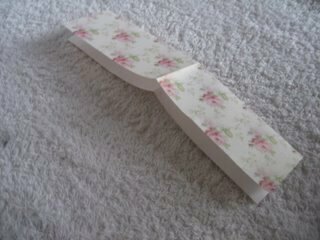 And because small amounts of paper are used, it is another excellent way to use up scraps from your favourite papers. 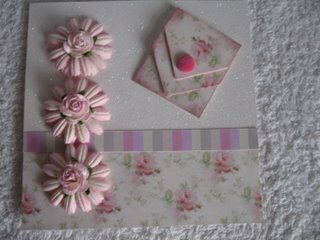 Incorporate them into your designs for a mix and match look. So easy to make and yet so effective. Ready to have a try? OK here we go! Choose your papers. It's best to keep the pattern smalll. Keep the rest to add to your card. Fold the top corners of one edge towards the center. 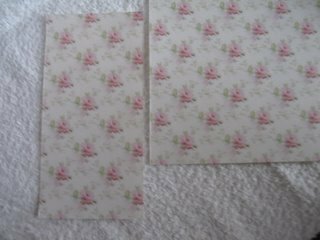 Then fold it back towards the widthways fold, and crease sharply. Fold the other end in towards the centre and then fold it so that it is just above the other flap. This is how it will look when you have creased the paper. 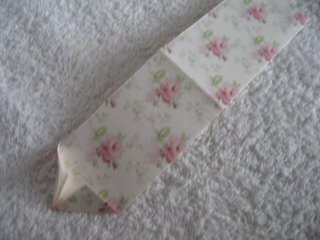 Ink the edges if you like, just to add definition and secure the flaps closed with a brad, gemstone, flower or a button. I used the other piece of paper on the bottom of my card, and glitter card for the top. 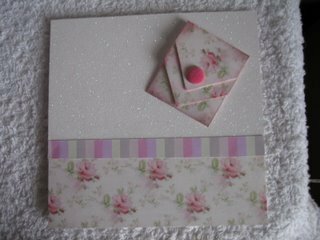 I joined the two together with some stripy paper and added the envelope to the top. Then dress it up with stuff from you "stash"
Take a look at the other projects for ways to use up odd bits of your papers...just don't throw them away!